Car insurance rates could go up thanks to texting and driving. What if your car insurance company could tell if you’re texting and driving, and adjust your rates accordingly? The answer to that question may not be theoretical for long. The technology works by using the smartphone’s accelerometer and gyroscope to sense whether the device is being moved — likely in a driver’s hand — or lying flat on a surface. Arity can also tell whether the phone is unlocked and apps are being used. Allstate (ALL) may soon use the technology to determine consumers’ car insurance rates. In a statement, it described the technology as a way to promote safe driving. Arity analyzed data from 160 million trips by hundreds of thousands of Allstate drivers. What it found confirmed research showing that drivers on their phones are more dangerous. Arity then went a step farther and used Allstate claims data to see how expensive distracted driving is. 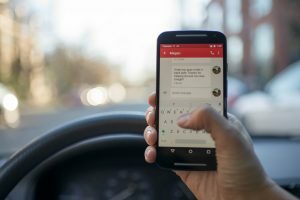 It says it found that the most distracted drivers cost insurance companies 160% more than the least distracted drivers. When it comes to car insurance, Seeman Holtz Property & Casualty is an excellent place to turn. We believe in providing each individual with not only the right insurance, but with the right service to meet your needs. We are an independent Boca Raton based national insurance agency offering major insurance carriers across the country, featuring all lines of personal and commercial insurance with unrivaled attention to client service. Now is the perfect time to take a second look at your auto insurance coverage and get a complete assessment of your current auto policy that could save you hundreds of dollars per year. Call us today at our insurance company main offices for in Boca Raton Florida for a free auto insurance quote.